I know I won't be winning any awards for originality with today's post, but I still think this pumpkin soup is worth talking about. And at the very least, it's worthwhile to post the recipe (even though it is as simple as could be). On Sunday, after an exceedingly long stint away from home due to some work-related travel, there was nothing I wanted more than to make a big pot of soup - perfect for slurping right from the wooden spoon and for storing for future meals. I may have gone a bit overboard - I made not one, but two gigantic pots of soup (putting our new large dutch oven to good use, I might add). Both were delicious, warming, and hearty without being in any way heavy. No meat (except for the light chicken stock), and no cream. When it comes to soup, I like them vegetable-y, and they often replace the salads that I eat when fresh green vegetables are at their prime. So yes, the wholly unoriginal, but undoubtedly delicious, soup of the day is pumpkin. I've made plenty of squash soups before, but I realized Sunday that I can't remember ever having actually roasted a whole pumpkin. I've made pumpkin bread, pumpkin cake, pumpkin pie, pumpkin cookies, pumpkin cinnamon rolls, pumpkin biscotti, pumpkin bread pudding...the list goes on...but I've always resorted to the canned stuff. 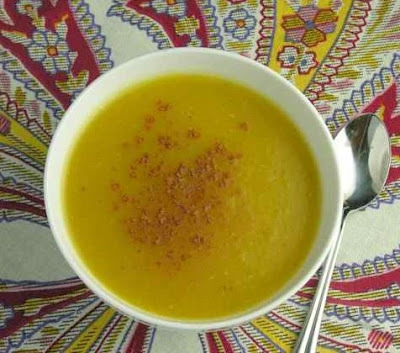 Now I'm not saying that I don't like canned pumpkin - I still love it - but for a savory soup like this one, where pumpkin is the star, it's definitely worth the extra effort to find a little sugar pumpkin and roast it yourself. I roasted mine using a method I learned last week on Martha Stewart Living, and it involves cutting the pumpkin in half, scooping out the seeds, adding a tablespoon of water to each half, covering with parchment and foil, and then roasting until soft - about an hour. Once the pumpkin is done, the rest of the soup comes together in about 10 minutes: saute the onion and garlic with an apple, add the pumpkin and some stock, and puree until smooth and delicious. I love the simplicity of this soup and the clarity of the flavors. The deeper sweetness of the pumpkin is just right with the sweet-tartness of the apples, and the onion and garlic deepen all of the flavors in a subtle, savory way. Perfect for kicking off a fall dinner party (which is what I'm planning to do with the soup tonight), but also, I'd imagine, perfect for a low-key comfort dinner served with some hearty bread and leftovers (tomorrow's dinner, if everything goes according to plan). 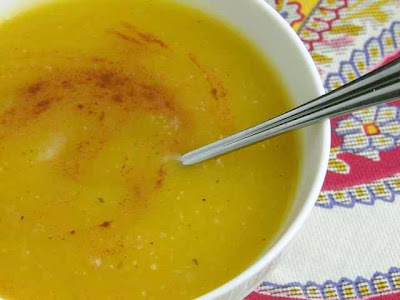 I've seen and enjoyed a variety of highly-spiced pumpkin soups, laced with curry or chili powder, but this one is very simple, with a hint of cinnamon and nutmeg and just the right amount of salt and pepper to tie things together. And although I love spice, this version really hits the spot. Enjoy! 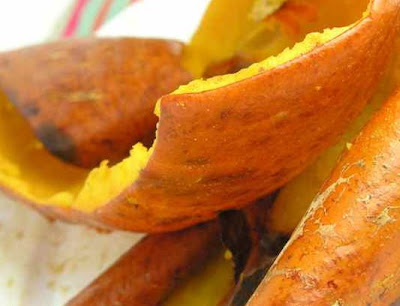 Roast pumpkin: Cut pumpkin in half and scrape out all of the seeds and gunk. Place on a baking sheet, cut side up, and add a tablespoon of water to each half. Sprinkle with salt and pepper, place a sheet of parchment on top, and then cover the whole pan tightly with foil. Roast at 375F for about an hour, or until the flesh is soft and scoopable. Meanwhile, heat a bit of oil in a soup pot, then add the onions and the apple. Saute for about 5 minutes, then add the garlic, salt and pepper, and saute for a few minutes more, being careful not to let the onions and garlic brown. 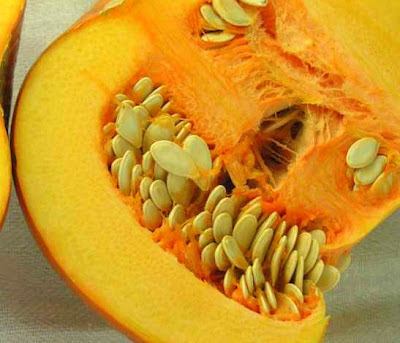 Scoop all of the flesh from the pumpkin and it, along with 2 c. of stock, to the pot. Bring mixture just to a boil, then simmer for a minute or so. Using an immersion blender (or a regular blender, if need be), blend the soup until completely smooth. Add additional stock as necessary to reach desired consistency. Adjust the seasonings, adding a bit of nutmeg or cinnamon, if desired. Serve warm with a thick slice of crusty bread.